Beaujolais (boh-zhuh-ley) is a French wine generally made of the Gamay grape which has a thin skin and is low in tannins. Beaujolais tends to be a very light-bodied red wine with relatively high amounts of acidity. This summer-friendly red wine should be enjoyed at 55 degrees although I prefer mine at 58 degrees. They are not very complex but don’t let that scare you away. These are easy drinking reds with flavors being very forward and charming. I was lucky enough to be part of this Beaujolais online tasting event from Georges Duboeuf. Here are the three wines I sampled. Georges Duboeuf Julienas Chateau des Capitans ’09 (NOTE: Decant for 1 hour): Color of plum with aromas of peach and summer fruits. On the palate was raspberries, peach pit (it’s better than what that may sound), with a hint of tropical flavors. This was my absolute favorite of the 3. Georges Duboeuf Brouilly ’09: Color of dark cherries with unbelievable balanced aromas/flavors of cherry, plum, and strawberry pie. This was my second favorite of the 3 but was close to #1. 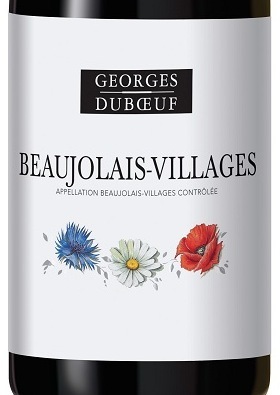 Georges Duboeuf Beaujolais-Villages ’09: Color of cherry juice and purplish tints with aromas of jellied strawberries with some mild spice. On the palate was freshly made grape jam. A nice starter wine!